(UPDATED - 12/6/2017) Generally considered the biggest non-playoff matchup of the bowl season, USC-Ohio State is sure to be a great game and an expensive ticket. The game came about more for political reasons than anything else – the bowl selection committee wanted to keep Ohio Stat from a third consecutive Fiesta Bowl appearance and wanted to avoid a rematch of last season’s epic USC-Penn State Rose bowl. So, the Fiesta and Cotton traded participants. One of the four oldest bowl games (the Cotton Bowl was first played in 1937), the Cotton Bowl has generally had its best gates when a regional team – think Oklahoma, Texas A&M – is in the mix. But Ohio State may well bring enough fans to make this Cotton Bowl one of the top three priciest since 2010. 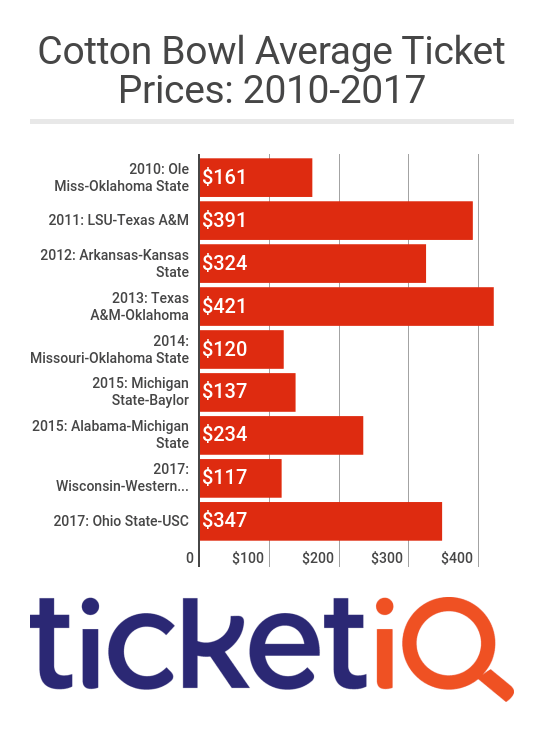 With a current TicketIQ.com asking price of $347, the game sits as the second most-expensive in history behind the 2013 Texas A&M-Oklahoma matchup, which clocked in at $421. The next most-expensive ticket was 2011’s LSU-Texas A&M ($391). For both Ohio State and USC, the Cotton Bowl is a decent consolation prize. Ohio State, which finished the season ranked No. 5, is returning to the site of its 2014 national championship and that nostalgia is sure to make Buckeye fans head south for New Year’s Day. But this time around, tickets should be a bit cheaper – the average cost of a ticket to that national championship game was $858, according to TicketIq.com. This year’s ticket will likely be the second-most expensive since 2011. USC is making its fifth bowl appearance in the last six seasons and has seen a marked upgrade in destination after playing back-to-back Holiday Bowls (2014, 2015). The $347 asking price is a distant second to last season’s Rose Bowl ($743), but well above the 2014 Holiday Bowl, which fetched an average of $192 per ticket. Whether money is no object or not, TicketIQ.com can help you get into the game for a reasonable price. Currently, according to TicketIQ.com, prices range from a measly $24 up to a mind-blowing $20,069. 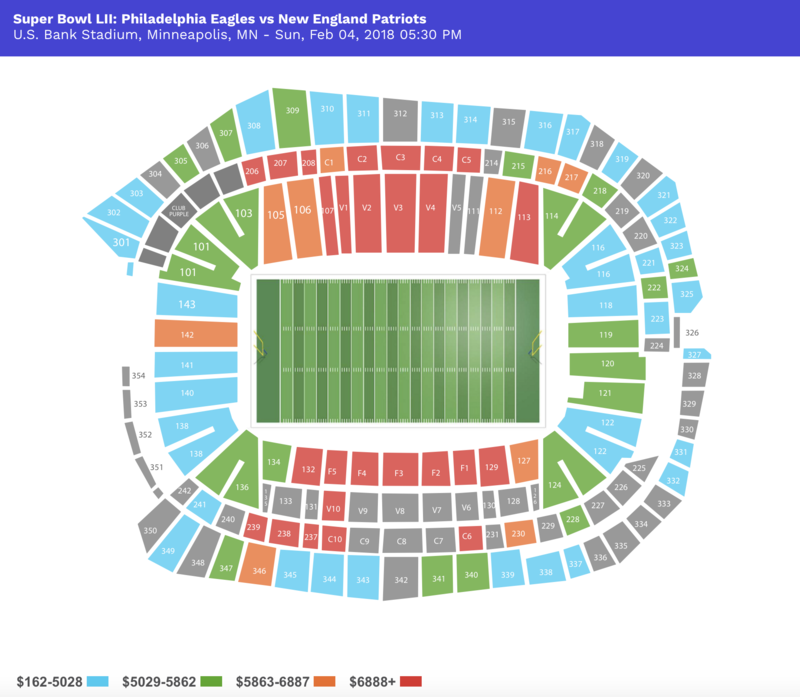 Among the Low Price Guarantee listings, you can snap up a spot in the third deck in Section 431 for $88 or closer to the field in the center of the end zone in Section 223 for $118. (UPDATE - 12/8) Baylor might not have gotten into the College Football Playoff, but they’ll stay close to home playing in the Cotton Bowl at AT&T Stadium. The Bears will take on the Michigan State Spartans out of the Big Ten. The current average price for the Cotton Bowl on the secondary market is $147.77, which makes it the second most expensive non-playoff bowl game. The get-in price for the game is $37. Though this isn’t a playoff game, it will be a contest between two top 10 teams by the AP Poll. Baylor is currently ranked No. 4, while Michigan State is No. 7. ... (UPDATE) Prior to 2010, the actual Cotton Bowl, which opened in 1930 and is more famously known as “The House That Doak Built” due to the crowds that ex-SMU running back Doak Walker drew during his career, hosted the annual Cotton Bowl game. In 2010, Dallas officials opted to move the Cotton Bowl match-up to the Dallas Cowboys’ AT&T Stadium in Arlington, Texas. AT&T Stadium’s enormous venue has put more emphasis on the game and fanfare associated with the match-up. Plus, the appeal of AT&T Stadium was attractive to the organizers of the College Football Playoff. With the inception of the College Football Playoffs, AT&T Stadium and the ‘Cotton Bowl’ will host its first semifinal game in 2016 and will host a semifinal game every three years thereafter. Since AT&T Stadium will only host a College Football Playoff game once every three years, the Cotton Bowl will feature two ‘at-large’ teams during the off-years from the College Football Playoff. In the past, the game had featured an SEC conference team against a Big-12 Conference team, but there are no longer conference affiliations associated with the game, leaving many enticing match-up possibilities between Power 5 conferences. While the game may still feature a Big-12 Conference or SEC team, the lure of adding a Pac-12 Conference or Big-10 Conference team may be enticing to the organizers. Over the last month, demand for Cotton Bowl tickets has decreased. According to TicketIQ, the average ticket prices for the Cotton Bowl has fallen from $344.38 to $314.43 while the get-in price has declined from $119 to $107. Still, Cotton Bowl tickets prices are nearly up by 170% from last year when average ticket prices were $120. Regardless of the pairing, fans should expect a spirited battle between two top teams. ... The Cotto Bowl has been played annually since 1937. Until 2010, the game was played in the actual Cotton Bowl Stadium in Dallas. In 2010, however the annual bowl game was moved to AT&T Stadium in Arlington in hopes to make the bowl part of the BCS. The bigger stadium and retractable roof made the game more appealable for bigger schools. The move did not get the Cotton Bowl to be a part of the BCS but, starting this season it will be part of the rotation for the College Football Playoffs. The Cotton Bowl will serve as a playoff semifinal for the 2016 season with the Orange Bowl. As part of the rotation, the bowl will host a semifinal game once every three seasons. During the off-years, the bowl will host two of the country’s top at-large schools because of no official affiliation with a conference. Up until this season, the bowl had been tied to the SEC with one of the top-ranked schools from the conference guaranteed participation in the bowl. For the past three seasons a Big 12 team has been the SEC’s opponent in the bowl. However now with no affiliation, there are many matchups possibilities between conference that have not been otherwise available in a major bowl game. This year, the current average price for Cotton Bowl tickets is $344.38. That's 187% above the average for last year's game when the average seat cost just $120. The current get-in price for this year's game is $119.